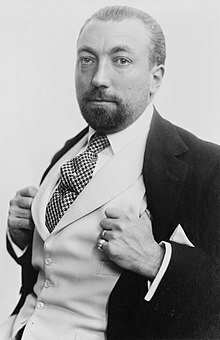 Paul Poiret (20 April 1879, Paris, France – 30 April 1944, Paris) was a leading French fashion designer, a master couturier during the first two decades of the 20th century. He was the founder of his namesake haute couture house. His contributions to his field have been likened to Picasso's legacy in 20th-century art. Poiret was born on 20 April 1879 to a cloth merchant in the poor neighborhood of Les Halles, Paris. His parents, in an effort to rid him of his natural pride, apprenticed him to an umbrella maker. There, he collected scraps of silk left over from the cutting of umbrella patterns, and fashioned clothes for a doll that one of his sisters had given him. While a teenager, Poiret took his sketches to Louise Chéruit, a prominent dressmaker, who purchased a dozen from him. Poiret continued to sell his drawings to major Parisian couture houses, until he was hired by Jacques Doucet in 1896. His first design, a red cloth cape, sold 400 copies. Poiret later moved to the House of Worth, where he was responsible for designing simple, practical dresses. The "brazen modernity of his designs," however, proved too much for Worth's conservative clientele. When Poiret presented the Russian Princess Bariatinsky with a Confucius coat with an innovative kimono-like cut, for instance, she exclaimed, "What a horror! When there are low fellows who run after our sledges and annoy us, we have their heads cut off, and we put them in sacks just like that." Poiret established his own house in 1903, and made his name with his controversial kimono coat and similar, loose-fitting designs created specifically for an uncorseted, slim figure. He designed flamboyant window displays and threw sensational parties to draw attention to his work. His instinct for marketing and branding was unmatched by any other Parisian designer, although the pioneering fashion shows of the British-based Lucile (Lady Duff Gordon) had already attracted tremendous publicity. 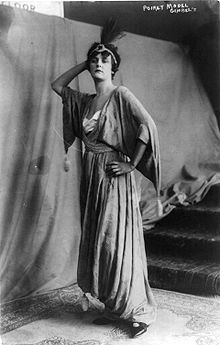 In 1909, he was so famous, Margot Asquith, wife of British Prime Minister H. H. Asquith, invited him to show his designs at 10 Downing Street. The cheapest garment at the exhibition was 30 guineas, double the annual salary of a scullery maid. Poiret's house expanded to encompass interior decoration and fragrance. In 1911, he introduced "Parfums de Rosine," named after his daughter, becoming the first French couturier to launch a signature fragrance, although again the London designer Lucile had preceded him with a range of in-house perfumes as early as 1907. In 1911 Poiret unveiled "Parfums de Rosine" with a flamboyant soiree held at his palatial home, attended by the cream of Parisian society and the artistic world. Poiret fancifully christened the event "la mille et deuxième nuit" (The Thousand and Second Night), inspired by the fantasy of a sultan's harem. His gardens were illuminated by lanterns, set with tents, and live, tropical birds. Madame Poiret herself luxuriated in a golden cage. Poiret was the reigning sultan, gifting each guest with a bottle of his new fragrance creation, appropriately named to befit the occasion, "Nuit Persane." His marketing strategy, played out as entertainment, became the talk of Paris. A second scent debuted in 1912 – "Le Minaret," again emphasizing the harem theme. In 1911, publisher Lucien Vogel dared photographer Edward Steichen to promote fashion as a fine art in his work. Steichen responded by snapping photos of gowns designed by Poiret, hauntingly backlit and shot at inventive angles. These were published in the April 1911 issue of the magazine Art et Décoration. According to historian Jesse Alexander, the occasion is "now considered to be the first ever modern fashion photography shoot," in which garments were imaged as much for their artistic quality as their formal appearance. A year later, Vogel began his renowned fashion journal La Gazette du Bon Ton, which showcased Poiret's designs, drawn by top illustrators, along with six other leading Paris designers – Louise Chéruit, Georges Doeuillet, Jacques Doucet, Jeanne Paquin, Redfern, and the House of Worth. However, notable couture names were missing from this brilliant assemblage, including such major tastemakers as Lucile, Jeanne Lanvin and the Callot Soeurs. Also in 1911, Poiret launched the École Martine, a home decor division of his design house, named for his second daughter. The establishment provided artistically inclined, working-class girls with trade skills and income. In 1911 Poiret leased part of the property at 109 Rue du Faubourg Saint Honoré to his friend Henri Barbazanges, who opened the Galerie Barbazanges to exhibit contemporary art. The building was beside Poiret's 18th century mansion at 26 Avenue d'Antin. Poiret reserved the right to hold two exhibitions each year. One of these was L'Art Moderne en France from 16–31 July 1916, organized by André Salmon. Salmon called the exhibition the "Salon d'Antin". Artists included Pablo Picasso, who showed Les Demoiselles d'Avignon for the first time, Amedeo Modigliani, Moïse Kisling, Manuel Ortiz de Zárate and Marie Vassilieff. Poiret also arranged concerts of new music at the gallery, often in combination with exhibitions of new art. The 1916 Salon d'Antin included readings of poetry by Max Jacob and Guillaume Apollinaire, and performances of work by Erik Satie, Darius Milhaud, Igor Stravinsky and Georges Auric. Early in World War I, Poiret left his fashion house to serve the military. When he returned in 1919, the business was on the brink of bankruptcy. New designers like Chanel were producing simple, sleek clothes that relied on excellent workmanship. In comparison, Poiret's elaborate designs seemed dowdy and poorly manufactured. (Though Poiret's designs were groundbreaking, his construction was not – he aimed only for his dresses to "read beautifully from afar.") Poiret, increasingly unpopular, in debt, and lacking support from his business partners, soon left the fashion empire he had established. In 1929, the house was closed, its leftover stock sold by the kilogram as rags. When Poiret died in 1944, his genius had been forgotten. His road to poverty led him to odd jobs, including work as a street painter, selling drawings to customers of Paris cafes. At one time, the 'Chambre syndicale de la Haute Couture' discussed providing a monthly allowance to aid Poiret, an idea rejected by Worth, at that time president of the group. Only his friend and one of his right hand-designers from his pre-WWI era, France Martano (married name: Benureau), helped him in his era of poverty, when most of Parisian society had forgotten him. At the end of his life, he dined regularly in her family's Paris apartment and she made sure he was not wanting for food. (He'd previously erased her from his memoirs, as he'd sent her to New York City in his place when he'd been invited for a long-term visit to design for Broadway in 1917/18 and was infuriated that she'd become an independent couturier upon her return to Paris.) His friend Elsa Schiaparelli prevented his name from encountering complete oblivion, and it was Schiaparelli who paid for his burial. Though perhaps best known for freeing women from corsets (although he did not single-handedly accomplish this revolution) and for claiming authorship of the hobble skirt, harem pants, and "lampshade" tunic, Poiret's major contribution to fashion was his development of the dressmaking technique known as draping, a departure from the tailoring and pattern-making of the past. Poiret was influenced by antique and regional dress, and favored clothing cut along straight lines and constructed of rectangular motifs. The structural simplicity of his clothing represented a "pivotal moment in the emergence of modernism" generally, and "effectively established the paradigm of modern fashion, irrevocably changing the direction of costume history. Poiret's spectacular fashion designs feature prominently in the collections of fashion museums worldwide. They have been displayed in many exhibitions over the years. One such exhibition was "Paul Poiret and Nicole Groult, The Masters of Art Deco Fashion" (Paul Poiret et Nicole Groult, Maîtres de mode Art Déco) at Palais Galliera in Paris in 1986. In May 2005, the fashion designer Azzedine Alaïa exhibited Denise Poiret's wardrobe in a show called "Free Creativity" (La Création en Liberté) in his showroom before it was auctioned. Denise Poiret's personal sartorial collection broke sales records: in particular, an auto coat that Paul Poiret had designed for her in 1914 went under the hammer for 110,000 Euros. The Metropolitan Museum of Art in New York purchased many pieces at this auction sale, which was the core of the first American retrospective on the dressmaker from May to August 2007, entitled Paul Poiret: King of Fashion. In 2011, this show traveled to the Kremlin in Russia to celebrate the hundredth anniversary of Paul Poiret's visit to Moscow and Saint Petersburg. Additionally, Poiret's perfumes, the Parfums de Rosine, are preserved in several cultural institutions, including the Osmothèque in Versailles. In 2013, the Musée International de la Parfumerie in Grasse showcased the pioneering perfume branch of Poiret in an exhibition entitled Paul Poiret: Couturier Perfumer. 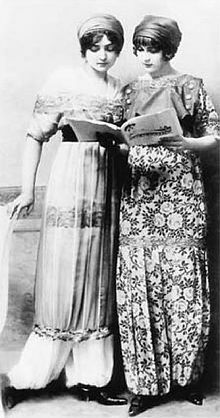 In 1905, Poiret married Denise Boulet, a provincial girl; they would later have five children together. Denise, a slender and youthful woman, was Poiret's muse and the prototype of la garçonne. In 1913, Poiret told Vogue, "My wife is the inspiration for all my creations; she is the expression of all my ideals." The two later were divorced, in 1928 after twenty-three years of marriage, in a proceeding that was far from amicable. Commercially inactive since 1933, the Poiret brand has attracted the interest of many. Several owners shared the rights to the brand name until the Luxembourg-based company Luvanis, which specializes in reviving dormant brands, acquired the global trademark rights to Paul Poiret in the early 2010s. Luvanis, now the sole owner of Poiret, asked the London investment bank Savigny Partners to find the most suitable entrepreneur. The South-Korean fashion and luxury conglomerate Shinsegae International, which also distributes the brands of Givenchy, Céline, Brunello Cucinelli, and Moncler, was thus chosen to reawaken Poiret after a long, careful selection process. Luvanis, convinced by Shinsegae's ambition, creative vision, and respect for the heritage of Poiret, sold it the rights to the brand name in 2015. After mounting press speculations, Shinsegae officially confirmed in January 2018 the international relaunch of Poiret from Paris with Belgian businesswoman Anne Chapelle at its helm, and Paris-based Chinese couturiere Yiqing Yin as its artistic director. Poiret is expected to show its first new collection in March 2018 after a 90-year hiatus. ^ Mazzeo, Tilar J., The Secret of Chanel No. 5, (2010), p. 26; Bigham, Randy Bryan, Lucile – Her Life by Design (2012), pp. 46–47. ^ Art Bulletin of Victoria, Issues 34–36. Victoria: Council of the National Gallery of Victoria. 1994. p. 35. Mulvagh, p. 19, suggests that the jupe-culotte was introduced by Poiret, Bourniche and Margaine-Lacroix, while books on Poiret credit it to him alone. ^ "Poiret, sœurs et sans reproche". Libération.fr (in French). Retrieved 28 November 2017. ^ Menkes, Suzy (26 April 2005). "Liberty belle: Poiret's modernist vision". The New York Times. ISSN 0362-4331. Retrieved 28 November 2017. ^ "Catalogue de la vente La Création en Liberté : Univers de Denise et Paul Poiret (1905 -1928) à Piasa – Fin de la vente le 11 Mai 2005". www.piasa.auction.fr. Retrieved 15 November 2017. ^ "Poiret". The Metropolitan Museum of Art, i.e. The Met Museum. Retrieved 15 November 2017. ^ Tchekourda, Jekaterina (11 October 2011). "Poiret, the Forgotten Fashion Designer". Retrieved 28 November 2017. ^ Osmothèque – Conservatoire international des parfums. Official website. Web. 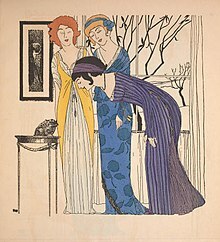 ^ "Paul Poiret, premier couturier parfumeur, célébré à Grasse". Culturebox. Retrieved 28 November 2017. ^ Socha, Miles (27 October 2014). "Paul Poiret Poised for Brand Revival". WWD. Retrieved 28 November 2017. ^ Friedman, Vanessa. "Fashionistas and Investors Start Salivating: Paul Poiret Is For Sale". On the Runway Blog. Retrieved 15 November 2017. ^ Wendlandt, Astrid (5 July 2017). "The Rebirth of Paul Poiret". The New York Times. ISSN 0362-4331. Retrieved 15 November 2017. ^ Ahmed, Osman (30 January 2018). "Anne Chapelle's Next Move: Rebooting Poiret". The Business of Fashion. Retrieved 3 February 2018. ^ Borrelli-Persson, Laird. "Poiret Is Being Revived a Century After Its Heyday—Will It Matter to Fashion Audiences in 2018?". Vogue. Retrieved 3 February 2018. Wikimedia Commons has media related to Paul Poiret.